A haven for Durian enthusiasts! This is true for several reasons. When you meet a king, you'll never forget it. The same is true of a Durian. 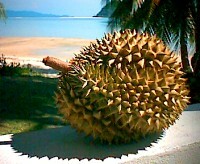 You will never forget meeting a durian up close! 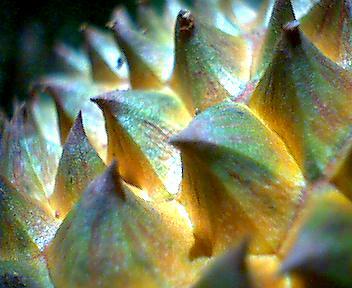 They're spiky. 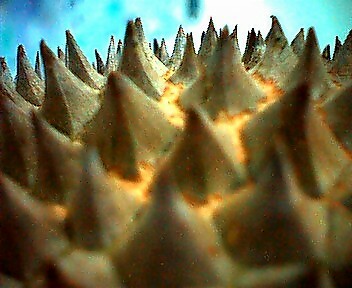 Really spiky. Pointy no matter how you try to hold it, they can puncture you if you're not careful. The round fruit itself is exactally the opposite to the delicious creamyness inside... of course that's if you can get inside! (Read How to Eat Durian). The taste of a durian is unforgetfull. You will always remember the first time you taste one. The interesting thing about durians is that they have a SMELL and they have a TASTE. While these are indeed interlinked, the smell of the durian is not always equal to the deliciousness of the fruit. Many people don't ever taste a durian because of it's smell... all the more for me! Well, if you've ever eaten a durian around someone who doesn't like durian you're likely never to hear the end of it. This website is a haven for durian lovers. The content was complied by our good friend Shunyam Nirav and most of the photographs and data was passed onto us after he passed away. I think he'd be glad to see more information on Durians out there, as he was one of the world's formost experts on this King of Fruits, the Durian. Botanically speaking, durian is a member of the plant familyBombacaceae, which also includes the baobab (Adansonia digitata) of tropical Africa, malabar chestnut (Pachira aquatica), bombax (Bombax ellipticum), silk floss tree(Chorisia speciosa), and the balsa or corkwood tree (Ochroma pyramidale). Visit Durian Haven's profile on Pinterest.